I THINK I'M GOING CRAZY!!!! Wow! I must be way sicker than I thought - now I am hallucinating! There is a house sailing along on the lake! Now I have seen it all! Thankfully I wasn't that sick, it really was a house sailing along on the lake, hmmmmmmm! The city sky was out to impress this week and I was lucky enough to catch this stunning sunset from my window. I especially liked this last one as it was more abstract than anything. For lots of views of the sky, visit Skywatch Friday. After a positive response last week I am transporting you again to the Galapagos Islands. It seems a perfect time of year to escape the cold and grey outside and travel via computer to these wonderful Islands. This time I am going to take you into the water because there is as much diversity to be seen there as on the land. This was a very major hurdle for me because although I swim adequately my least comfortable element is definitely the water, either on it or in it. However I was not going to take this trip of a lifetime and not take advantage of every moment. So how to snorkel in thousands of feet of water without freaking out? I went to a scuba store and was fortunate enough to talk with a wonderful lady who said that it was absolutely no problem and there was a special flotation device designed especially for snorkeling which didn't push you onto you back like a normal life jacket. So there I was, all kitted out with my geeky fluorescent yellow inflatable device, ready to go! The sea is the lifeblood of the Galapagos Islands, the diversity of birds and animals would cease to exist without the rich surrounding waters. 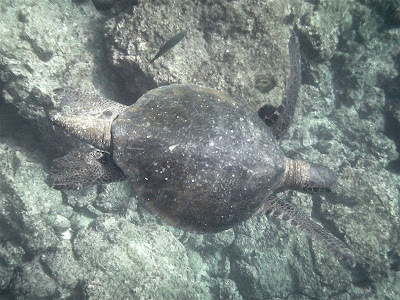 It was not until 1986 that a presidential decree was issued establishing a Galapagos Marine Resources Reserve. The area was then declared a UNESCO World Heritage Site in 2001, including the entire waters surrounding the islands to a distance of 15 nautical miles. And as soon as you start to look into the water it is clear to see why this was so important. Marine Iguanas Amblyrhynchus cristatus diving to graze on the algae growing on the rocks. Galapagos Green Turtles Chelonia mydas agassisi floating sedately past. Sally Lightfoot Crabs Grapsus grapsus scuttling around in the shallows. The water is positively brimming with life. But you really have no idea just how much is there until you get below the surface and thanks to my husband taking a little underwater camera with him, I can show you. 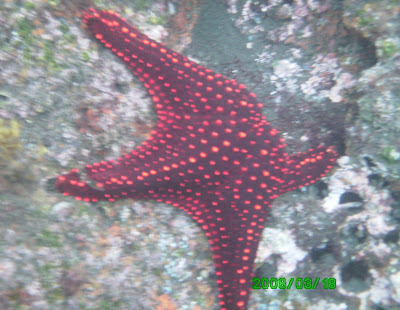 These spectacular Sea Stars were all over the place, this one was well over 12 inches across. There was also a Sea Star that looked exactly like a chocolate chip cookie, I didn't learn until later that it was actually called the Chocolate Chip Sea Star! 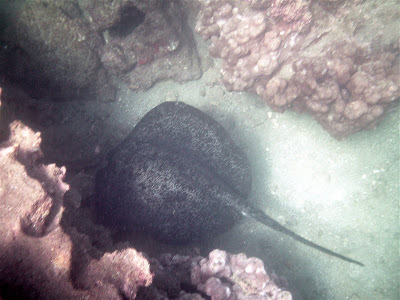 Another stunning sight were the numerous rays wafting by like large underwater blankets. 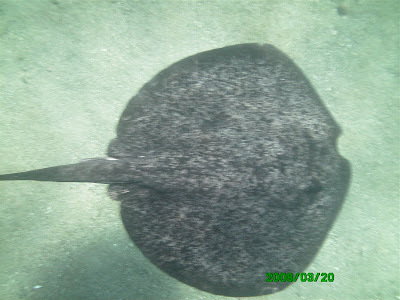 Unfortunately I am not expert enough to identify the rays above but the one below is a Sting Ray Dasyatididae spp. 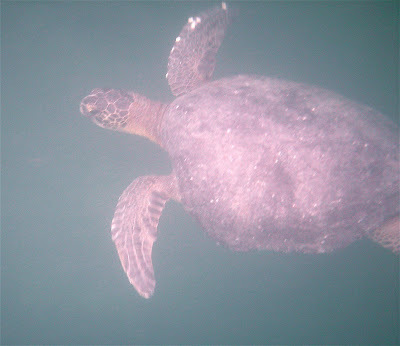 Despite the various hair-raising stories about these creatures that have done the rounds since the demise of Steve Irwin, they were very peaceful and just carried on doing their thing as we swam near them. Speaking of hair-raising! 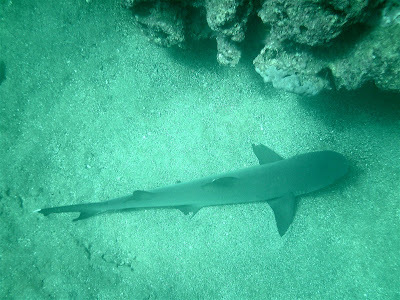 There is nothing more sobering than being in the water when you meet your first shark! Although the White-Tip Reef Shark Triaendon obesus is not known to attack humans, you do suddenly feel rather small and feeble! One little character that was an absolute delight was the Galapagos Penguin Spheniscus mendiculus. How on earth my husband managed to get a picture of one I can't imagine as these little birds fly through the water like little fat bullets! The only one that I got a really good view of was the one that swam right up to my mask and screeched to a halt about six inches in front of me - I don't know which one of us was more surprised! 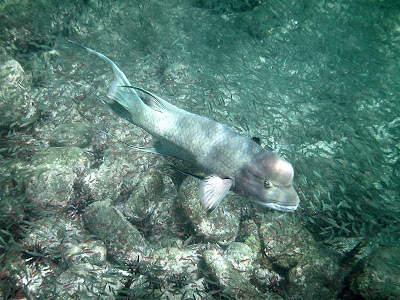 But the prize for the clown of the seas has to go to the Galapagos Sea Lion Zalophus wollebaeki. 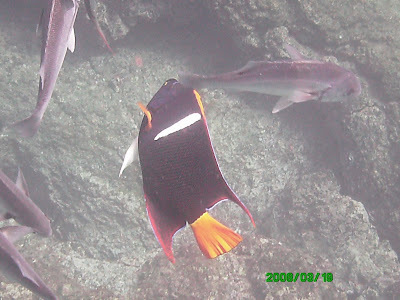 These guys actually tried to play with us in the water although they always seemed rather unimpressed with our inability to stay underwater for minutes at a time! My husband had great fun with this little guy when he discovered that if he blew bubbles, the Sea Lion would do the same! And in case you think I have forgotten one vital ingredient of life in the water, yes there was a whole kaleidoscope of fish of every colour, shape and size. PHEW!!! You can come up for air now and dry yourself off! Thank you for swimming with me. Next week maybe we'll take to the air for a change! 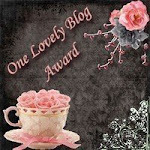 For many great postings from cool locations all over the globe, check out That's My World. In 2005 a new sculpture by English artist Anish Kapoor was placed in Grant Park, Chicago. Known affectionately by Chicagoans as 'The Bean' its actual title is Cloud Gate because of its wonderful reflective images of the sky. This amazing work of art is 66 feet long and 33 feet high and, just like the sky, it looks different every day. For many more great skywatch images visit Skywatch Friday. One of the many species of creatures under my care at work are Caribbean Land Hermit Crabs Coenobita clypeatus. These fascinating creatures are not the easiest animals to observe unless you suffer from insomnia because they are strictly nocturnal. I have just finished adding various animals to an exhibit we are doing called 'In the Dark' and my Hermit Crabs are one of the species we are showcasing. The exhibit illustrates how different species adapt senses other than sight to a life in the dark. All the animal's cases are lit with moonlight spectrum lights during the day and daylight spectrum during the night so they are at their most active when the Museum is open. One of my lovely crabs was in a state of undress! As with many crustaceans, when a Hermit Crab grows it has to shed its exoskeleton to reveal a new one underneath, this process is called ecdysis. The crab is incredibly vulnerable at this point because the new exoskeleton is very soft, as you can see in the picture below. When the moult is complete the crab will then eat the old exuvium in order to re-absorb the calcium it contains. Before you get too excited, no, I don't live on the Galapagos Islands! However I did visit them earlier this year and it was because my husband took so many great photos of the trip that I started my blog in the first place. 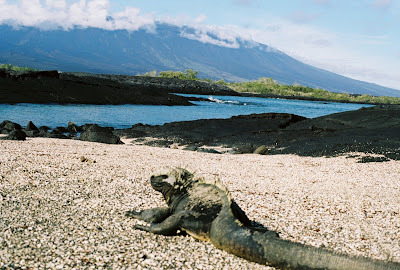 The Galapagos are an archipelago off of Ecuador. They are formed by the movement of a tectonic plate over a hotspot in the earths crust. As the plate moves over the hotspot different islands erupt out of the sea to form a chain. Over the millenia the islands slide away from the hotspot and through gradual erosion, eventually disappear back into the sea. At one end of the chain there are bare rocks that carry less life forms and are essentially just used as breeding grounds for ocean going birds. 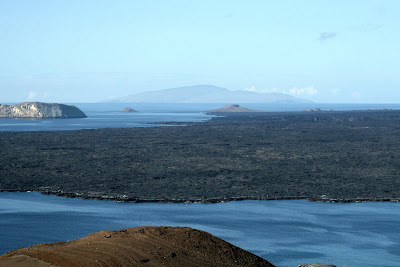 At the other end of the chain, the 'new' islands show frequent volcanic activity and are just beginning to get populated with various life forms. Here is a fresh lava field that has flowed out into the sea. One of the first species to inhabit this newly formed land is the lava cactus Brachycereus nesioticus. In between the two extremes there is a huge diversity of habitat that supports the legendary range of species associated with the Galapagos. Of course the most famous of these is the giant land tortoise. 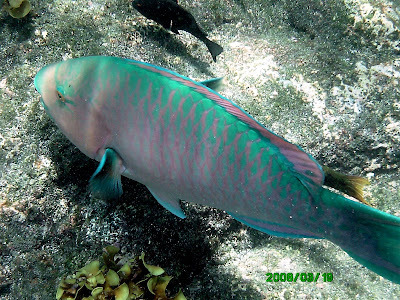 There were originally fifteen sub-species on the islands, there are now eleven remaining and a very active breeding program in place to keep these populations strong. 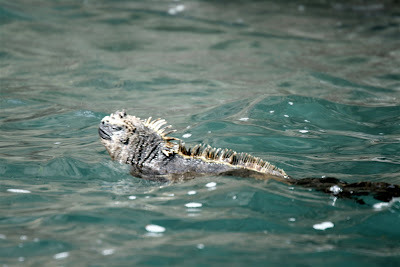 Another unique creature is the Marine Iguana Amblyrhynchus cristatus, the only iguana in the world that has adapted to swim and feed in the sea. The one in this picture is wearing a lava lizard on his head, as well as being a very stylish fashion accessory, the lava lizard does a great job of eating all the pesky little flies that swarm around the iguanas face, so both animals benefit. Of course the Galapagos is also known for a rather famous human visitor too. 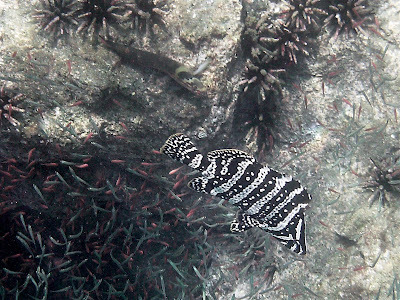 Charles Darwin was quite spellbound by the diversity of unique species he found on this tiny archipelago and it was the inspiration for his masterpiece 'The Origin of Species.' One group of creatures that contributed greatly to the writing of this book were the numerous finches found on the islands. There are thirteen different species, all with very subtle differences and it was these that really set Darwin on his course of study. One species that Darwin didn't see on his visit is the Flightless Cormorant Phalacrocorax harrisi I can't help feeling that he would have found it easier to make his point on evolution if he had seen it! Of all the species of cormorants that occur around the world, this is the only one that has evolved to flightlessness because of the lack of land predators. One great conservation success story of the islands is that of the Galapagos Fur Seal Arctocephalus galapagoensis, which is actually a sea lion! This diminutive pinaped was hunted to the brink of extinction because of its luxurious thick fur. It is generally thought that its habit of hunting at night was one thing that saved it because it made it so much harder to catch. Hunting is now banned and the population is flourishing. You can see from this sleeping beauty that they have learned very quickly to ignore the silly humans that pass by! 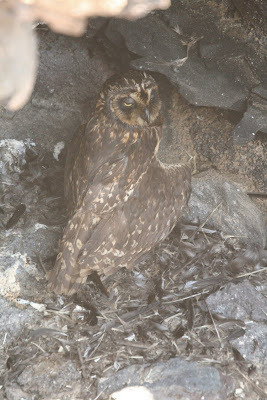 There is also a short-eared owl that has adapted in a very unique way to island life. 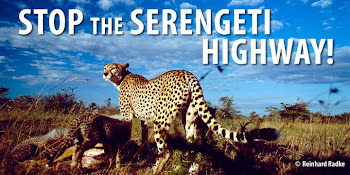 Instead of hunting at night, in the air, they have adapted to ambushing their prey underground. The tiny storm petrels roost and nest in their hundreds in cracks and cavities in the lava. The owl squeezes its way into these spaces and waits for the little petrel to return and then grabs it! The owls are very rarely seen but we were lucky enough to see one hiding out. Where ever you turn on these amazing islands there is incredible, unique wildlife, and so much diversity for such a tiny landmass. Please let me know in your comments if you liked this whistle-stop tour because if you did I can certainly revisit it in a future posting. Nothing makes me more angry than humans knowingly subjecting animals to pain, suffering and/or an agonising death. This week someone took it upon themselves to poison the pigeons in our local park. As the museum where I work is located in the park and I am the Manager of Vertebrate Collections, if there is ever an animal emergency I am the person who is called. Yesterday there were five separate pigeons bought into the Museum by concerned people who had found them writhing and flailing around on the ground. Most of them were too far gone to be able to help and died within a few minutes of them arriving. A couple of them were taken to the local bird rescue to have their systems flushed through with a charcoal solution in an attempt to remove some of the toxins. We all have our own opinions about city pigeons and I am not about to get into that but whoever did this surely must have failed to see the bigger picture. The Peregrine Falcon Falco peregrinus is a state listed endangered species that was at one point extirpated from the region. Thanks to the hard work and dedication of a few people it has been successfully reintroduced and there is now a healthy population living and breeding in the city of Chicago, their primary food source being - pigeons! We also have Swanson's Hawks Buteo swainsoni, another state listed endangered species, living in the neighbourhood, feeding largely on pigeons, and several Coopers Hawks Accipiter cooperii that hunt birds in the park too. If any of these raptors were to pick up a poisoned pigeon it would doubtless poison them too. Not to mention any other scavengers or even someones dog. Irresponsible behavior like this just makes my blood boil. The pigeon may not be the most glamorous bird out there but surely it has as much right to live and breath on this planet as we do. In my mind they rank up there with the likes of the Grey Squirrel or the Canada Goose, they have learnt to survive and be successful in spite of what humans do!! Anyway, my rant is now over so on a lighter note, I saw this charming little fellow when I was walking in the park this morning. He is a Hooded Merganser Lophdytes cucullatus and he is a sure sign that the seasons are changing as we only see these delightful little characters during the fall and early winter. Although they are listed as year round residents for this area, they seem to find our close proximity to Lake Michigan a little too chilly in the depths of winter and so head further inland. The Hooded Merganser finds its prey underwater by sight. The merganser can actually change the refractive properties of its eyes to enhance its underwater vision. In addition, the nictating membrane (third eyelid) is very transparent and probably acts to protect the eye during swimming, just like a pair of goggles. The male Wood Ducks Aix sponsa are also looking very handsome at the moment in their full breeding plumage. Sorry, these aren't the best of shots but being city ducks, whenever I tried to take a photo they swam towards me into the shade of the trees at the waters edge! Eventually they realised that I wasn't going to feed them and then became totally disinterested! Wood Ducks nest in trees and will also readily use nest boxes, so if you are fortunate enough to have land that these charming ducks inhabit, do a bit of research and put up some nesting boxes. There is nothing more appealing than watching a female Wood Duck with her flock of tiny ducklings in tow.